Last time we learned what should go in a diaper bag when going out with a baby. But what about outings with toddlers and preschoolers? Do you need to bring stuff for them? What kind of stuff is needed and how much? What kind of bag should you carry? I’ll try to answer all those questions here. Remember that what you bring depends on where you are going, how long you will be out for, and how many kids you are packing for. When I go out, I have to bring stuff for a baby, toddler and preschooler. Thankfully most of the items overlap so I don’t need to double them up. Going out with a toddler takes a lot more out of you than going out with a baby. 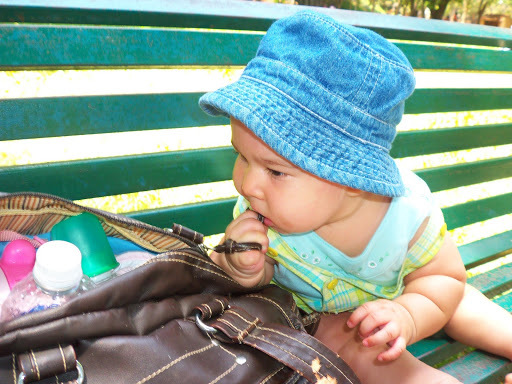 Toddlers can run you ragged and you need both hands free to keep up with them, so you may want to opt for a backpack, though a shoulder bag or even your regular diaper bag could work too. – Snacks – cookies, crackers, carrot sticks, rasins, cut fruit (non-messy), banana, etc. Since they are older, they need less stuff when out. 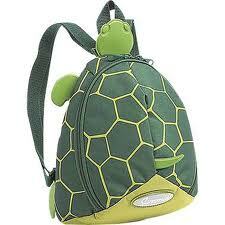 You could always have them carry their own essentials in a small backpack. 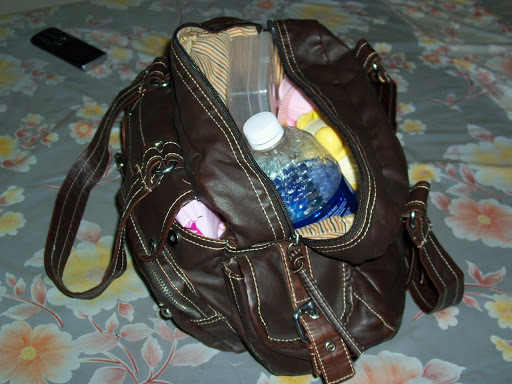 Mommies, what do you pack for your outings? Do you have tips on packing for more than one child, and more than one age group? Picture this: it is your first outing with your newborn. You are excited about going somewhere since you have been stuck in the house for so long, waiting for your baby to be old enough for outings. You get dressed, dress the baby, grab your purse and head out. It isn’t until you get where you are going that you remember you were supposed to bring … something. What was it? Baby decides it is time to do one of those poops, the kind that leak and spread all over his clothes … and you. 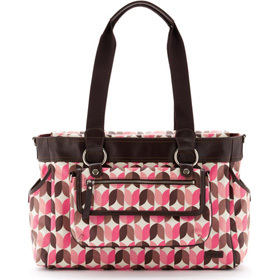 Now too late, you remember what you forgot – the diaper bag. Hopefully this hasn’t happened to you. I’d never wish such horror on anyone (unless I hate them. Then I might just laugh.) Going out with your baby means lugging enough supplies for a small army. How can you keep it down without forgetting anything? 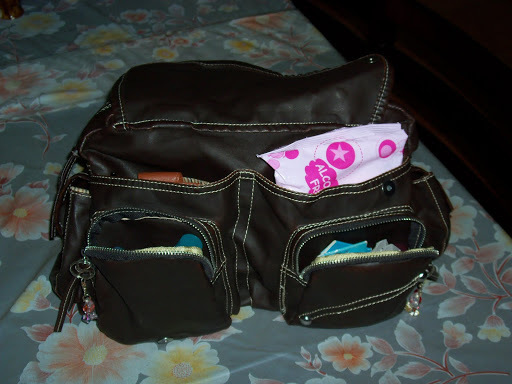 Changing pad – some diaper bags come with one attached. If yours doesn’t, pack one. Change of clothes – in case of diaper leaks, throwing up, etc. 1 – 2 bottles and formula – if you don’t breastfeed or if your destination doesn’t provide privacy for breastfeeding. You could either bring the sterilzed water in the bottles and the can of formula, or carry the water in a separate bottle and measure the formula into the clean bottles before you leave. How much you bring will depend on how long you will be out and how many feeds your baby will need in that time frame. Bring a bottle brush if needed. Hand disinfectant – so you can clean your hands even if you aren’t near a bathroom. Light-weight sheet for covering baby or to put down on a seat or bed before you put the baby down. Snacks or baby food – if your baby is old enough for solids and will need them. Bag options are endless, so whether you have a bag with lots of pockets for sorting everything (my personal favorite), or you have one where everything goes in one place, try keeping it sorted and organized in some sort of order so you don’t have to dig through it when looking for something. 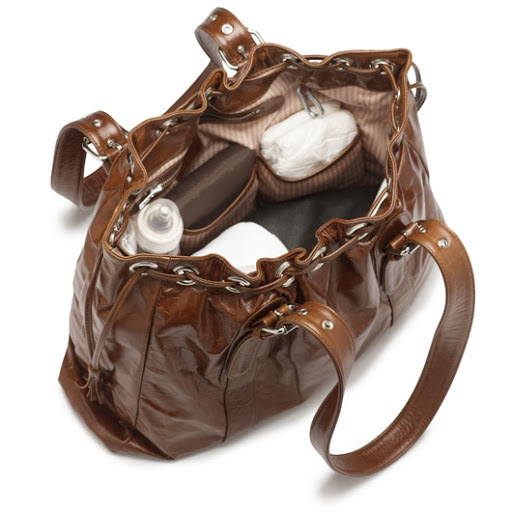 Keeping each item at your fingertips will make it easier for you to use your diaper bag. It should be your friend, not something you come to dread carrying. 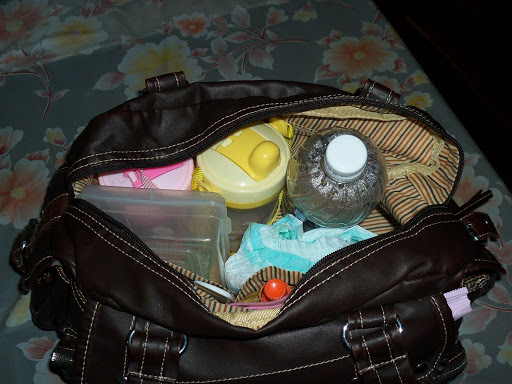 Mommies, care to share what you put in your bag and how you use it? Elegant and practical, I take it with me wherever I go. Many pockets make carrying needs easy. 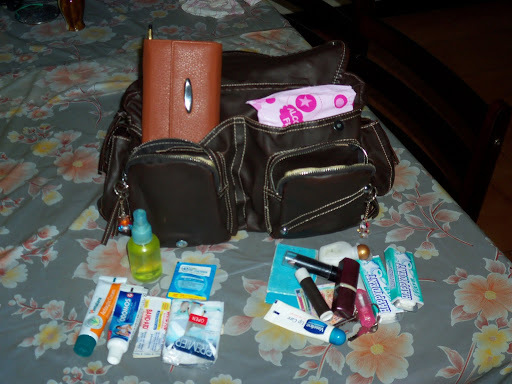 Right – lipstick, lip balm, keys, gum, wipes for cleaning my glasses, hand cream. Inside: Water bottles for all of us. It is easier to carry one for each of the kids than one for all of us to share. That way they can drink what they want at their pace without having to wait for the other to finish. 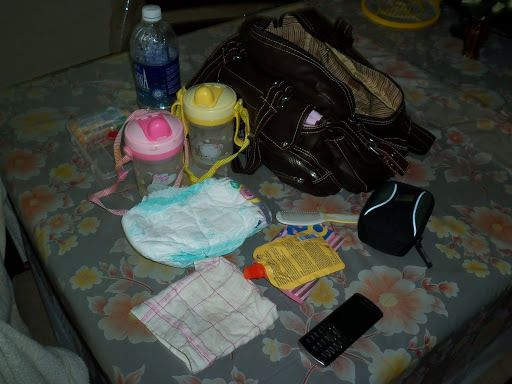 Extra diaper, snack box, comb, sun screen, bib, hankerchief (good for wiping sweat off your head when out)and phone. I also include a change of clothes for each of them if we plan to be out for a while. One is for the camera and the other will be useful for the baby’s bottles. Yes, I plan on breastfeeding, but when out, it is often hard to find a private place to feed and if I’m at the playground with the kids it isn’t possible at all. So I always carry a small (4 oz.) bottle of water and another one with powder formula. That way, if the baby is hungry but we aren’t ready to go home, I just add water to the formula, shake it and we are good to go. Baby is fed and happy and I can let the kids play in peace. I know this will happen because it happened when Lila was tiny. I didn’t use formula with Logan since it was easier to stop and nurse him. I only had him to watch and didn’t have to worry about a kid running off while I’m nursing the baby. Also, we were living in Bangalore at the time and it is cooler there so he didn’t mind having a sheet over his head while nursing, but Lila always hated it, and I can’t blame her, as it is so hot here, anything over your head makes you sweat like crazy. So I started carrying the formula for her and it saved many a stressful moment when she was tiny. This time around I know better and have planned ahead for it. The bag itself still has plenty of space for the other things I will need for the baby: extra diapers, change of clothes, sheet, changing pad, and I could even fit in a few books and toys if needed. Now, why do I use such a big bag? Well, the more kids you have to carry stuff for, the bigger the bag you need. 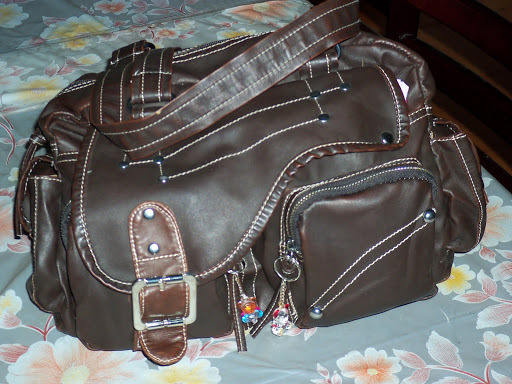 But it isn’t that this bag is so big but that it has lots of outside pockets that have lots of space. See, I used to carry a purse and diaper bag, but I quickly learned that it wasn’t practical to carry both, so I switched to only carrying a diaper bag. My first one was nice, small and compact, perfect for only one child. 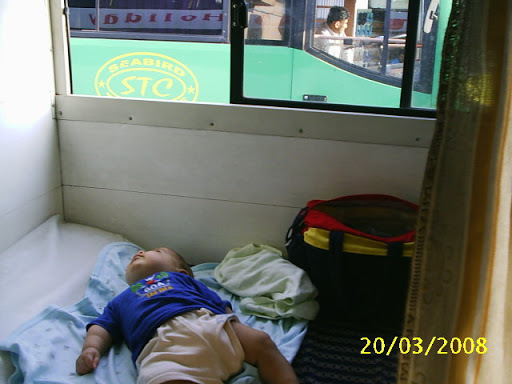 Logan on his first bus trip at 4 months old. But I wore it out from overstuffing, so when I was given this one, though it wouldn’t have been my choice, I used it until it fell apart. 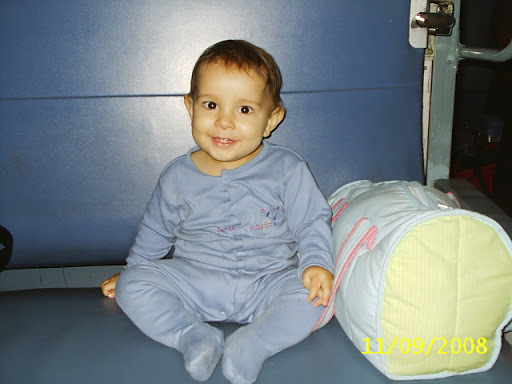 Logan on his first train trip at 10 months old. I then decided that I needed something that looked nicer but could still carry everything. I opted for a large purse. This one served me for a while but I eventually found it just didn’t open up wide enough and I’d have to take everything out when I needed something off the bottom. Lila on her first train trip at 8 months old. I didn’t want another diaper bag that looked like a diaper bag. I’ve realised that a mommy can still look classy and carry what she needs for her kids, so I wanted something nice but useful. 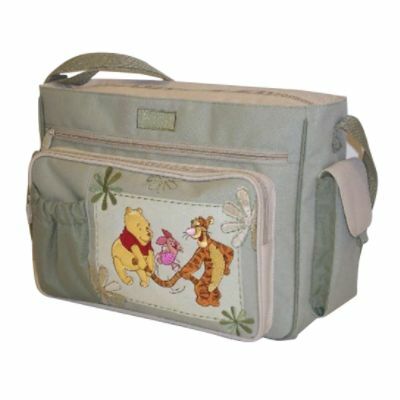 I also wanted something well made, as often, because diaper bags are plastic lined, the lining will rip easily. This bag is well made and it is water resistant. It only looks like leather. I searched all over, but when I spotted this one, I knew it was the one. That is why this nice bag is my new best friend.